Stethoscopes are one of the most useful and underrated tools in the medical profession. Not only are they useful for general exams, but they help you take the vital statistics which may be needed for a proper diagnosis. The quality of the stethoscope you own will be a reflection of the quality of care that you provide as a doctor, nurse, or medical student. That’s why you need to best stethoscope possible. Stethoscopes are often associated with determining a patient’s blood pressure or pulse rate, but as a doctor you know there is much more versatility with this one tool. You can listen to the lungs in addition to the heart. You can also listen to a patient’s bowels to hear if there is anything unusual going on. When you own the best stethoscope for your practice, you become more effective at what you do. Stethoscopes haven’t evolved very much since they were first invented in 1816. A young doctor named Rene Theophile Hyacinthe Laennec needed to examine a young female patient and didn’t want to place his ear on her chest. He rolled up 24 sheets of paper, placed one end on the woman’s chest, and then the other end to his ear. Just a year later, a formal stethoscope was being used in his practice as a diagnostic tool. Over the next 200 years, the stethoscope would become longer and more flexible, but the principles would remain the same. Sounds can travel through solids, so doctors can easily hear sounds from within the body by using this tool. Recent innovations include sound cancellation, bell microphones for sound magnification, and double bell designs to help doctors hear many different sound frequencies. This allows you to hear what is going on with a patient with more accuracy, lending to a better overall treatment plan. Yet some may ask a very simple, but profound question: why do doctors still need stethoscopes today? To be honest, many patients don’t feel like they’ve been properly examined until a complete physical workup and interview takes place. The stethoscope exam is sometimes a utility need, but is often more ceremonial than anything, especially if you are a specialist. Patients expect doctors to have a stethoscope. It puts them at ease. That is just as important when conducting an exam. We all know the detrimental effects of stress on health and nothing is more stressful than waiting at the doctor’s office for potentially devastating health news. Any stethoscope can reduce stress, but this isn’t the only need this tool is able to fulfill. Some doctors may need a high-powered stethoscope for their specialty so more information about the patient can be obtained. Others may need to conduct routine physical exams on a regular basis for their general practice. We’ve selected the best stethoscopes for doctors as rated by professionals in the industry so your specific needs can be met. What attracted us to this stethoscope right away was its stainless steel construction. This gives the stethoscope a natural advantage over the competition when it comes to being able to hear through the bell. You’ll also receive 3 different ear tips of standard sizing that fit most ears and are remarkably comfortable. The ear tips are included in the free-parts-for-life program offered by this brand, so you won’t have to worry about continuing costs. With a patented safety lock that keeps this stethoscope in its proper position, this small investment can pay off with some big rewards for your practice. The main advantage this stethoscope is able to provide is its adjustable frequency design. Instead of changing out your chest piece so you can hear specific frequencies, you can just adjust this stethoscope to hear what you need to hear while examining a patient. The ear tips are reasonably soft, but what stands out about the design is the reinforced yoke that is still molded into a flexible tube. When registered, you’ll receive free diaphragms and ear tips for life, plus this model is protected by a lifetime warranty. At first glimpse, this stethoscope looks more like one of those throw-away utility models that you can find in your equipment closet at virtually any medical facility. As we took a closer look, we discovered the adult diaphragm is actually larger than some other models at 48mm. There is a certain level of ergonomics incorporated into the design as well that helps you wear this stethoscope comfortably. It still only weights about a pound, is highly sensitive, and delivers a crisp sound. We were pleasantly surprised by what it can do and think you will be as well. The Harvey DLX features a triple-head design, allowing you to take care of virtually any examination need you may have. It’s a little longer than other stethoscopes at 28 inches, but that wasn’t bothersome when we took a look at this design. Not only are the bells interchangeable, including a pediatric option, but the comfort sealing ear tips are rotatable and interchangeable as well. If you want versatility with your stethoscope, this is the model we would highly recommend to you. We’ve put this cardiology stethoscope into the “best of” category because we were really impressed with the dual-leaf spring construction in the design. Not only does this increase the durability of the equipment, but it also supports two sound channels, one for each ear, so you can catch some faint murmurs that might be going on. It also offers a convertible pediatric diaphragm so you can customize the unit for your practice. With a sound range of 100-1000 Hz, this was also one of the best stethoscopes for reducing ambient noise. Nurses are deep in the trenches of patient care each and every day. They are constantly offering comfort to patients in a variety of ways while also taking care of their basic physical needs. Whether it’s in an emergency room or a long-term care facility, many nurses are also discovering that a stethoscope is a remarkably useful tool that helps them get through each shift. Nurses using a stethoscope is like watching science, technology, medicine, and love being intricately balanced together in a world-class recipe. 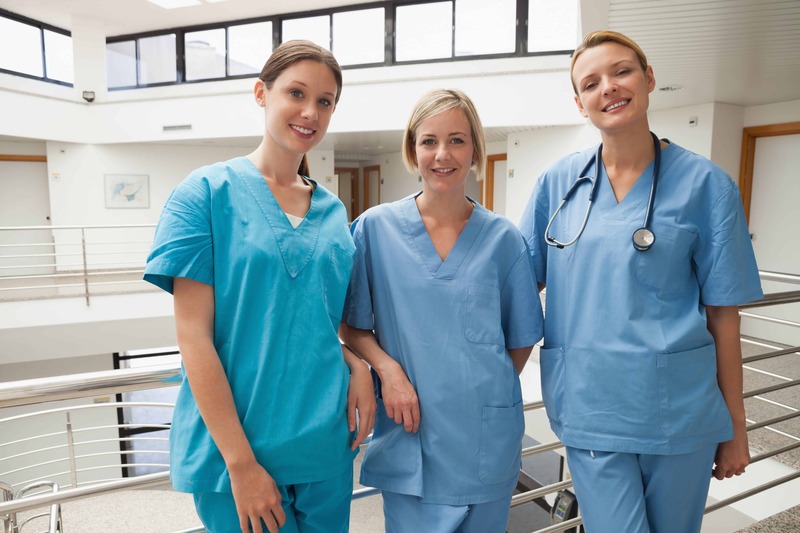 Many people still see nurses in their original role – providing bedside comfort. Today’s nurse is required to do a job that is much more complex, which means knowing how to do several medical-based tasks at an expert level. Stethoscopes help nurses be able to monitor patients receiving vasoactive medicine. They help nurses be able to take an accurate blood pressure reading or track vitals for a doctor. Nurses start an IV, know what medications are needed for a specific patient condition, and also know what medications shouldn’t be given. In many ways, it could be argued that a nurse needs a better stethoscope than a doctor. Although the doctor might provide the initial diagnosis and communicate a treatment plan to a nurse, it is the nurse who makes sure the patient gets the care that is needed. It’s not just a job of doing what the doctor says to do, offering a sponge bath, and bringing in three squares a day. It is a job that requires a nurse to keep monitoring the health of a patient so they can get better. Then there are the nurse practitioners who are working in their own practice, providing general care to patients in their community. In this role, a stethoscope is required for a general physical exam. Sometimes NPs run into the same issue that doctors have where there is more of an expectation of using a stethoscope than a practical need to have one. Yet they can also be used by nurses today in acute settings so that a patient’s respiratory, cardiac, and intestinal state can be immediately examined. Length is an important consideration for the stethoscopes that nurses use. You’ll find that there are 3 different sizes that come standard in this category. 22 inches. This type of stethoscope is generally used for pediatric exams, but can be used in other settings as well. 27 inches. This is the “standard” stethoscope length, used in a wide variety of applications. 30+ inches. Longer stethoscopes have also become available to help nurses who are taller or need a little more distance in their personal boundaries with a patient. If for no other reason, using the stethoscope as a nurse can help address the anxieties a patient may have. With the right length and a bell designed for the job at hand, nurses can be more than supportive today. They can provide effective care in whatever setting they happen to be. This lightweight stethoscope is the perfect addition to your daily equipment when you have a lot of vitals to take during a shift. It is a single-sided chest piece, but the diaphragm is tunable so you can hear both low and high frequencies. This allows you to check blood pressure levels with much more accuracy. It’s light around the neck, small enough to fit into a scrub pocket if necessary, and features high performance single-lumen tubing. If you’re looking for a stethoscope that can match up with your style, then this stainless steel model that is plated with rose gold could be the right equipment for you. The gold plating adds to the cost of the unit, but also lends to a higher level of durability. You’ll love the non-invasive ear tip adapters that come with this unit and the sounds which it hears are crystal clear. It’s a little shorter than other stethoscopes at 25 inches, but it stands up to daily use or the rigors of medical school with ease. If you are a cancer survivor, have one in your family, or you just want to show your support for those who are fighting this terrible disease, then this is the stethoscope for you. $5 of the proceeds from each of these stethoscopes will be contributed to the American Cancer Society to help finish the fight against breast cancer. In return, you receive the only dual-sided chest piece in the entire cardiology line of stethoscopes from this brand that lets you care for adult and pediatric patients. It’s versatile, durable, and you’ll be supporting a great cause. Ever lose track of time when you’re going through your daily rounds? Yeah… it happens. With this 2-in-1 stethoscope that offers a digital LCD clock, you’ll be able to stay on time as you go about your day. The clock is also useful for certain timing needs that caregiving can often require. The timepiece is made of lightweight anodized aluminum and has been fitted with a unique ultra-thin fiber diaphragm which has been raised for greater amplification and transmission of heart and lung sounds. If you’re just getting into nursing, entering medical school, or work as a CNA, then this is a great entry-level kit to consider purchasing. You’ll get the stethoscope that you need, along with a blood pressure cuff and other caregiving essentials so you can care for people with ease. Don’t be fooled by the affordable price – we found the equipment to be of comparative quality to other equipment options in this category. Becoming comfortable with your stethoscope will help you be able to learn new skills effectively. Most people know that you wear a stethoscope by placing it around your neck, allowing you to have quick access to this tool when needed. For medical students, you’ll find that the stethoscopes in this category are much easier to determine when the ear tips are positioned in the front instead of the back so you can hear sounds much more effectively. Many stethoscopes for medical students also come with a dual bell design. This helps you be able to decide if you need to hear high- or low-frequency sounds. Then just apply gentle pressure on the stethoscope so you can hear the sounds you need to hear. Keep the tubing straight instead of twisted up, remember to wear gloves if you’ll be touching a patient, and then you’ll be ready to practice differentiating the different sounds you’ll be able to hear. The best stethoscope for medical students must be affordable, but it must also meet the standards of your medical school. We’ve selected these top-rated options for your consideration so you’ll be able to quickly meet your learning needs today. This stethoscope gets all of the basics right and doesn’t cost you a fortune. It’s lightweight, but has a high sound performance that is perfect for medical school. It’s durable enough to throw into your pack if needed, yet can also hang around your neck for movement wear if you’re going on rounds. The ear tips are replaced for life and you have three standard sizes that fit most ears. The design is also latex-free, in case your instructor may ask. This dual head stethoscope is perfect for medical students who need the ability to exam adults, infants, and children while being on a budget. It’s a 5-in-1 Sprague design that offers two sound channels through Lumen tubing so that you can detect some of the faintest sounds available. Even Korotkoff sounds can be detected accurately with this stethoscope with ease. The length of the stethoscope is a little longer than normal, which may take an adjustment period for some, but overall we loved the versatility it brings to the user. If you work in a care facility, like an assisted living center or a nursing home, then you’ll either need to train staff one day on how to take a blood pressure or listen to heart sounds or be trained to do it. This dual head stethoscope is an easy way for the teaching and training process to happen. Both people listen to the sounds of one patient so that hands-on learning happens with ease. The chest piece is of a rotating aluminum design and features a non-chill diaphragm. Electronic stethoscopes generally fit into two categories: amplifying or digitizing. It gives a new meaning to the chest examination, which is literally what the word “stethoscope” means in Greek. The benefit of using an electronic stethoscope is that it can hear certain frequencies that may not be heard by the human ear. The electronic circuitry of the stethoscope then translates what it “hears” into sounds that can actually be heard. As an added benefit, many electronic stethoscopes also have sound cancellation features which make it a lot easier to hear the needed sounds during an exam. With reduced interference, the actual sounds can be focused upon so that murmurs, gurgles, and other unusual noises can be detected with ease. Some stethoscopes in this category even come with software packages so that the sounds heard can be recorded and then saved as part of the patient’s electronic medical record. The costs of an electronic stethoscope are higher, but for certain medical specialists it could be just the thing that is needed for a correct diagnosis. You’ll find the top-rated electronic stethoscopes below for your review. We loved getting the chance to take a look at this tactical stethoscope. The ambient noise reduction is perfect. It allows the user to hear the low frequency sounds that can often be missed when using a standard stethoscope. The ear tips are not bothersome at all and the chest piece is CNC machined to exacting tolerances from surgical-grade stainless steel. It’s comfortable, it’s rugged, and the adjustable frequency technologies will make your exams be fast and effective. This might not look like your standard stethoscope, but you won’t believe the quality of sounds that you can hear when using it. Designed to work with any high quality headphones, it also provides users with a connection system that works with most operating systems, including PCs. It charges through a USB-type connection and gives you the opportunity to record your findings so they can be included in a patient’s EMR. It’s an investment, but one we’d make in an instant. As one of the most affordable ADF stethoscopes in this category, you’ll find a number of benefits come your way when using this particular model. The ear tips are soft and covered by warranty, so you won’t need to worry about those pressure headaches that come from other stethoscopes with extended wear. The reinforcing yoke is molded into flexible tubing that offers consistent sounds across a wide range of frequencies. We were very pleased with this scope and think you will be as well. “Go with the Littman stethoscope.” If you look at many cardiology forums online, this is the advice that is often given when looking for the best cardiology stethoscope. What matters more than the brand in this category is the subtlety of sounds that can be detected by the stethoscope during an exam. Cardiology patients may have very subtle murmurs and other issues that some stethoscopes may not be able to pick up. By having a shorter tube and greater sound amplification, cardiology doctors and medical students can get the information they need. Everyone tends to have their own preference of stethoscope in this category. Outside of Littman, you’ll find many recommendations for a Harvey stethoscope as well. Whatever your preference may be, look for a stethoscope that offers a tunable diaphragm and bells that can be swapped out so you can detect specific sound frequencies so a patient can receive the correct care that is needed. Cost tends to be an issue in this category as well, so study each stethoscope carefully to make sure you make the right investment the first time around. This stethoscope gets all of the basics right. With outstanding acoustics provided by the two patented tunable diaphragms, you’ll receive most frequencies without needing to turn the unit over. The two tube design also reduces rubbing noises that can occur with other cardiology scopes. It weighs less than a pound, which is another added benefit, and the copper edition looks great when you’re wearing it. Sometimes the best medical care comes from a positive first impression a patient receives – this scope will definitely provide that. What we liked about this particular cardiology stethoscope was its ability to be flexible. It offers users six different conversion attachments which allow you to have 9 total configurations available for patient care. This includes a complete infant, pediatric, and adult cardiology scope option. The Lumen tubing provides a dual sound channel design and the Y-configuration gives you stability when using the scope. Give it a try and we think you’ll enjoy the flexibility of this model just as much as we did. Although this stethoscope won’t compete with the high-powered cardiology scopes in this category, it is a great utility model that can help you out in an emergency. Light pressure allows you to hear some of the lower frequencies during an exam and the acoustic response is where you’d expect it to be. A lifetime warranty backs up your purchase. To be fair, the only real negative we see from this product is the treatment of negative reviewers – but customer service is not a reflection of product quality by any means. Giving a young child a physical exam has some unique challenges. Kids are naturally curious, so they’ll be grabbing at your tools as you’re trying to work. Other kids are fearful of a visit to the doctor, so when they see a huge metal stethoscope headed their way, they recoil and won’t let you touch them with anything. That makes it difficult to determine what may be going on with their health. The best pediatric stethoscopes tend to be shaped in fun, kid-friendly ways that invite the child to touch and even play with the tool. Animal shapes, fun colors, and other additions like heart shapes can all help to put a child at ease. Some doctors and nurse practitioners purchase a pediatric stethoscope in this category just so they can give a child something to play with while they’re being examined by a more traditional stethoscope. Rest assured that the top-rated pediatric stethoscopes will give you the power to help make an accurate diagnosis if need be. They’re also sturdy enough to handle some rough play from a child if that is your need. These stethoscopes are also reasonably affordable and an upgrade from the utility stethoscopes you’ll find in a medical closet at your office or hospital somewhere. Which model is going to help you the most today? Kids don’t always like a trip to the doctor. Who can blame them since the doctor tends to give out the scary vaccinations? Putting a child’s mind at ease can be challenging, especially if there is a disengaged parent along for the ride, but this scope can be a tool that helps. The 22 inch tubing is complimented by fun animal shapes that can help you engage with your pediatric clients so they can calm down and you can complete the exam. If something happens to it, then it’s affordable enough to replace without much difficulty. This pediatric stethoscope offers a frosted purple heart as part of the chest piece so that you have an easy way to engage with your youngest patients. The acoustics are surprisingly sensitive with this model, allowing you to hear sounds through clothing or even bandages for an accurate assessment. The head is also made from a shatter-resistant acrylic, so you can hand the equipment over to the child during the interview portion of the exam. Give it a look and we think you’ll love this simple design. Instead of animal shapes, this pediatric scope goes with animal prints and bright colors. You’ll still receive the same results as other stethoscopes in this category provide, though this scope works best with patients under 45 pounds. Weighing less than 6 ounces, it’s extremely lightweight and is latex-free. It works well enough through clothing and is suitable for many medical needs, from EMT use to veterinary technicians. Littmann stethoscopes are designed to provide doctors, nurses, and medical students everything they really need with this tool. It is the choice of many professionals because it delivers a profession-leading level of innovation, engineering, and consistent quality that other brands find difficult to duplicate. When you’re shopping for a new stethoscope, it is important to look at the manufacturing process to determine consistency. Far too many stethoscopes offer a manufacturing quality that has a wide range of acceptable standards. This means you’re gambling when you purchase the stethoscope. You could wind up with one that completely blows your mind with how awesome it is able to perform. You might also end up purchasing something that is virtually worthless. When you purchase a Littmann stethoscope, you are eliminating that gamble. Each stethoscope is built to a very strict process that incorporates tight quality controls. No matter what model you wind up selecting to best meet your needs, you will find from the chest piece to the ear tips a quality that is consistently higher than most other competitors. There are certain features with Littmann stethoscopes that really make them stand out. High acoustic sensitivity. The sensitivity levels vary by model, so you can select the right stethoscope based on your general care needs or the detailed diagnostic listening you’ve got to do. Tunable diaphragms. This is an invention that comes directly from 3M for Littman stethoscopes. It is a feature which allows you to be able to hear different sound frequencies without the need to reposition the chest piece. Next-Gen tubing. Ever notice how some stethoscope tubing breaks down over time thanks to the consistent contact it receives from alcohol or skin oils? Littmann tubing is less likely to pick up a stain and has improved resistance because it’s made without phthalate plasticizers or natural rubber latex. Additional features include snap-tight ear tips that are designed to be soft-sealing so that they conform to your ear and adjustable headsets so that you can be comfortable all day long using your stethoscope. The ear tips snap firmly onto the headset ear tubs for safety and your ears won’t feel painful after a few minutes of use like other stethoscopes can cause. This ultimately makes you more effective at the job you do or while learning new skills. Littmann stethoscopes might be heavy hitters during the diagnostic process, but they do so without a weight that can drag you down. This brand offers some of the lightest stethoscopes that are in the medical profession right now. The goal is to make sure that every component contributes a specific strength for the doctors, nurses, and medical students using the tool without compromising the quality of sounds received or adding to a burden that threatens to be stressful. Littmann stethoscopes are also designed with a precision chest piece that does a remarkably good job of resisting impact damage that occurs with regular daily use. This includes scratches and chemical damage. This means only one question remains to be asked: which of these Littmann stethoscopes is right for your needs today? This stethoscope has outstanding acoustics. There is a noticeable better sound that comes from the higher frequencies with this particular scope. Part of that comes from the classic design of this brand, but having the tunable diaphragm also helps. We also appreciated how easy it was to adjust the headset so you can have an individualized fit, and that adds to the comfort of using this scope. It resists stains, has a high level of durability, and in our opinion is definitely worth the investment. It’s great for nurses and it’s great for doctors. If you can afford the cost, it’s also great for medical students. Simple pressure changes let you take advantage of the tunable diaphragms in this design, while there is added versatility that allows for pediatric exams as well. Headset tension is really easy to adjust and the soft-sealing ear tips conform to your ears for added comfort. No matter what your medical setting or responsibilities may be, this scope will help you to work more effectively. If you’ve been thinking about getting a Littmann scope in the past and have been turned off by the price, then we’d encourage you to take a look at this pediatric model. With an overall length of 28 inches, you’ll still get a lot of versatility out of this model even if smaller patients aren’t always who you see. It weighs just over 10 ounces, so it’s fairly lightweight, and the non-chill rim and diaphragm helps to put patients at ease. This soft-touch scope offers users a precision-balanced experience that is second-to-none in the industry today. The ergonomic design helps to make it easier to receive the high acoustic performance it provides so an exam can be completed with relative ease. It’s a comfortable scope, gives you a secure grip, and simple pressure changes help you to tune into specific frequencies. If you give this model a try, we don’t think you’ll be disappointed with the results you receive. This stethoscope offers one of the best performances offered not only by this brand, but in the industry today. The chest piece delivers one of the highest acoustic performances that we’ve ever heard. A special procedures adaptor is included so you can effectively examine virtually any patient with this scope. Its single sided, offers a stainless steel design, and the two-in-one tube design minimizes outside ambient sounds. MDF Instruments is based in the United States and works to create medical tools that fit with your style. Because of this, you’ll find numerous professional stethoscopes in a variety of different colors, including Rose Gold, so that you can provide the personalized care patients need in your own way. New titanium stethoscopes are also remarkably lightweight, taking away a common point of strain pain that doctors, nurses, and medical students experience with extended wear. MDF Instruments also provides a free parts-for-life program with each stethoscope that is purchased. All you need to do is register your new stethoscope with the company and request parts from a specified form that can be accessed from their website. This gives you 100% free stethoscope replacement parts that can be shipped to you in no time. You must activate your warranty after receiving your stethoscope, which only takes a few minutes to do. If you have any questions about your new MDF stethoscope, you can also contact their “Customer Wow” specialists at 1.818.357.5647. With 45+ years of experience in this field, you can rest assured that the commitment to innovation and quality is present in each stethoscope so you can be the best in the world at what you do. This dual head stethoscope offers users a lot of value, though it is intended to serve as a pediatric scope for its primary use. The all-black design is a nice variation from the classic image of a scope, but it doesn’t alter the superior acoustics this model is able to provide. It is pre-angled at 15 degrees to give you a precision fit, so keep that in mind as you order in case that doesn’t fit your needs. If you want professional-grade equipment and you’re on a budget, this is a solid scope to consider. Some providers need to have a specific stethoscope to meet specific needs. Other providers need a more generic scope to meet a wide variety of patient needs. This MDF model provides the latter with rapid efficiency. The lightweight dual-head design can be adapted for adults, pediatrics, and even neonatal use if necessary. The end result is 9 different configurations that are rapidly changeable so you can move from patient to patient with relative ease. Give this scope a look today and we think you’ll love it as much as we did. If you’re looking for a high quality cardiology stethoscope, then this one has a large value proposition to offer. There are two sound channels that operate through the classic cardiology design so you can hear even the slightest of variations a patient may be experiencing. A free-parts-for-life program accompanies this latex-free scope, as does MDF’s traditional dual-leaf spring construction, providing the durable user experience you deserve. Grab yours today and you’ll love using this stethoscope for years to come. The American Diagnostic Corporation focuses on providing high quality products with world-class service so that you can create high levels of patient satisfaction. Many of their stethoscopes offer a proprietary design that is accompanied by high standards of quality control. US based inspections of the manufacturing processes for each model of stethoscope happen on a regular basis so that you can rest assured that you’re purchasing a tool that can meet the changing demands of the health care industry today. Many ADC products feature interchangeable components so that you have an unmatched level of versatility. Whether you’re trying to do some cross-training with your staff or you simply want a high quality, but affordable tool to help you with your practice, this brand will help you with its many guarantees. ADC is also one of only a small handful of companies in the health care industry to maintain both ISO 9001:2008 and ISO 13485:2012 certifications. If you want a proven stethoscope, then you need to consider one from this brand. This oversized scope has a sculpted ovoid chest piece that makes the variable frequency detection features very easy to access during an exam. It also features a reinforced yoke that makes carrying this scope virtually effortless. Silicone ear tips are stable when using the stethoscope and the attractive satin finish will give each patient an extra edge of confidence when they see you with this scope. Based on a zinc alloy and with a longer length at 30.5 inches, we think you’re going to love what this scope is able to do. This is your classic utility stethoscope, but with a couple of upgrades. The diaphragm has been designed to provide a greater level of amplification, giving you a crisper sound through the ear tips on a consistent basis. The headset has been molded into 22 inch PVC tubing and compliments aluminum binaurals with a matching satin finish for great looks and better durability. Maybe its biggest advantage is its lightweight design – at just 3.5 ounces, it’s one of the lightest scopes in any category right now. If you need a spare or something for medical school, this scope is going to get the job done. If you don’t want to spend a fortune on a high quality scope, but you don’t want to compromise on the value proposition, then this is an option to consider. It gives you the ability to convert between adult and pediatric exams with ease while enjoying the added enhancements of the classic cardiology design. Although it’s a little heavy at 2 pounds, the quality of the rugged construction of this scope outweighs that one minor negative. Prestige Medical focuses on personalizing the tools needed for patient care. With 40+ years of manufacturing experience in the industry, the goal has been to pair up diagnostic medical instruments with other accessories, such as medical uniforms, so that patient care can be individualized. Many of their products are marketed toward nurses and medical students, but anyone in the health care industry can benefit from the relentless focus on innovation that this brand offers. Prestige Medical only sells stethoscopes and other medical care accessories or tools to approved retailers. If you’re purchasing a stethoscope online, make sure the company offering the product has been approved as a retailer. Just fill out the form, indicate your country of origin, and you’ll be able to get the information you need. In the meantime, you’ll also want to take a look at each product to see if it has been built to meet your specific needs. We’ve selected the top-rated stethoscopes from this manufacturer so you can see if they have the capability to deliver for you. If you’re looking for an affordable utility scope that will help you take vitals with relative certainty, then give this model an option. The walled tubing is combined with an inside alloy sound conductor so that the acoustic transmission is accurate and reliable. A snap on rim and diaphragm is really easy to use and ambient sounds are kept to a minimum with the ear tip design. If you need a replacement scope quickly or want something that you won’t care about if you lose, this is a great option to consider. It might be called a “light” stethoscope, but this gold-plated option has nothing light about it. The acoustic transmission is fantastic and at just 6 ounces, it’s also light enough that it won’t cause user fatigue after a long shift on your feet. Many may purchase this stethoscope just for the looks, but the soft ear tips also reduce common pain points and that’s an additional plus. Whether you’re in med school, need something for your nursing duties, or you want something for your general practice, this scope will get the job done. We’d describe this particular stethoscope as a training model. Although it may have some general practice functions, like being able to take certain vitals, it’s more of a basic tool to use when there isn’t another scope available. It’s lightweight at just 4 ounces and for the price, the quality is better than what we expected to find. For what it does, it does well, and sometimes that’s all you can ask of a product. If your budget is tight, give this option a try. The best stethoscope for doctors, nurses, and medical students will help you be able to provide the consistent quality care that each patient deserves. Invest into your preferred stethoscope based on your specialty or position today so that every tomorrow can give you the opportunity to help someone with the very best of your abilities.